Bishop Lawrence Mukkuzhy was born on 31st August 1951 at Hosmota (Kadaba) as the 7th child of Late Smt. Rosa and Late Shri Thomas Mukkuzhy. After his school education at Aranthodu and Sullia, he joined St. Joseph's Minor Seminary, Thalasserry. His pre-degree course was at Nirmalagiri College, Kuthuparamba. He had his Philosophy and Theology studies at the Pontifical Seminary, Aluva and was ordained Priest on 27th December 1978 by Bishop Mar Sebastian Valloppilly. He secured Master's Degree in English Literature from the University of Mysore. Bishop Lawrence has to his credit a very good record of eventful and fruitful ministry in different Parishes. His first appointment was as assistant Parish Priest at Udane. He served as Parish Priest at Gandibagilu (1981-86) Kutruppady and Guthigar (1986-88), Belthangady, Kankanady, Mundaje and Malachowki (1988-94) and Chandanakampara (1994-97). In 1997 he was appointed Episcopal Vicar of Dakshina Kannada Mission and Parish Priest of St. Alphonsa Church, Mangalore. He has also served as Archdiocesan Consultor, Pastoral and Presbyteral Council member, President of Karnataka Catholic Educational and Charitable Society and President of the Dakshina Kannada Rural Development Society. He was appointed as the Episcopal Vicar for the Region in 1997. His Holiness Pope John Paul II appointed him as the first Bishop of the newly erected Diocese of Belthangady on 24th April 1999. 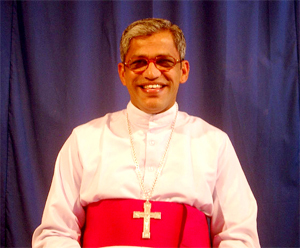 He was consecrated Bishop on 4th August 1999 by the Major Archbishop Mar Varkey Cardinal Vithayathil assisted by Archbishop Mar George Valiamattam of Thalassery and Bishop Mar Joseph Pallickaparambil of Pala and he assumed charge on the same day.